Olivia Hernaïz is a Belgian artist born in 1985. She first practiced as a copyright lawyer, before completing an MFA at Goldsmiths University of London. In 2017, Hernaïz won the first prize of Art Contest, supported by the Boghossian Foundation. Consequently, she had her first solo show in the Museum of Ixelles in Brussels. 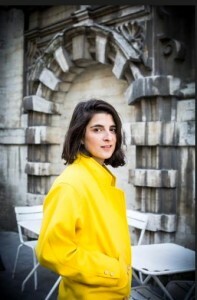 Her work has been featured in multiple exhibitions around the world, most recently at the Moscow International Biennale For Young Art, Russia (2018); Le Consulat, Collectionair, Lisbon (2018), Les Flâneuses, Art Night London (2018) and The Gathering, Panthera Today, Brussels (2018). Her work has been included in several video festivals such as The Screening at Ladron Galeria, Mexico (2017) and Meer-kost #1: Provenance, Dok Gent, Belgium (2018). Hernaïz research leads her to look into the pervasiveness of the myths on which our modern western societies are built. She calls into question the efficiency and legitimacy of imaginary structures that human beings have created in order to live together: banks, private property, democracy, laws, human rights, justice, money… Hernaïz expose her network of ideas using found materials collected compulsively – ideas of passers-by, derelict houses, political logos and bank slogans. Through this collection, she explores the organization of society and tries to understand what is left -if- to social interactions amongst individuals.